This method covers a procedure suitable for establishing acceptability of inter coat and surface adhesion of an organic coating system immersed in water. The procedure may be utilized as a production test. The photo illustrates the roller called for in the method. 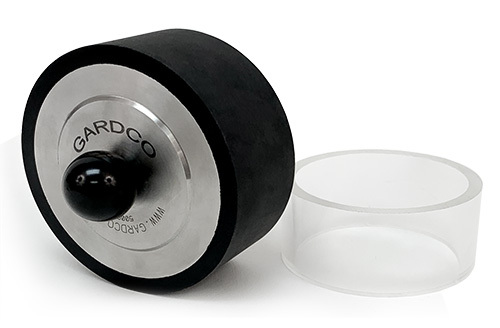 It is a 4-1/2 pound rubber covered roller having a surface Durometer hardness value within the range of 70 to 80. The roller is approximately 3-1/2" in diameter and 1-3/4" wide. It is made of steel and has two plastic handles. Apply the coating system to the substrate and allow to dry as specified in the product specification. Immerse the test specimen in distilled water for 24 hours. Remove the test specimen from the water and wipe dry with a soft cloth. Within 1 minute after removal from the water make two parallel scratches, one inch apart, through the coating to the metal with a stylus. See Scriber below). Immediately apply a 1" wide strip of the masking tape with the adhesive side down across the scratches. Press the tape against the surface of the coating by passing the roller across the tape eight times. Remove the tape with one quick motion and examine for damage to the intercoat or surface adhesion. 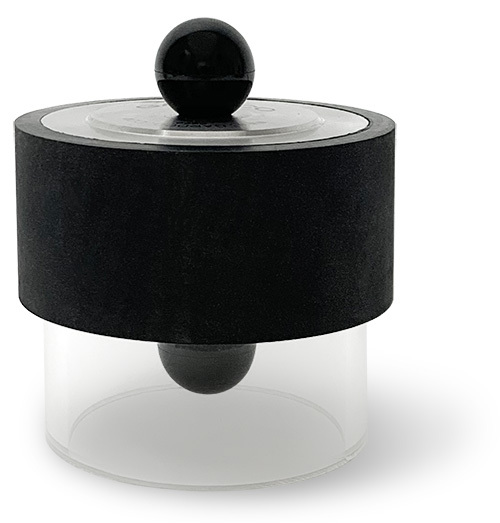 Store the roller using the acrylic ring stand furnished; this protects rubber mat from flattening. The Gardco carbide “Super Scriber” is of high quality Swiss workmanship – durable, long lasting, reliable, and light-weight but rugged.The slightly tapered shape and small diameter of the carbide metal scriber tip 1/16" (1.5mm) make it easy to use the “Super Scriber” in hard-to-get places.